"If I win it, I'm going straight to the Harley [Davidson] shop and having a Fat Boy for a fat boy!" 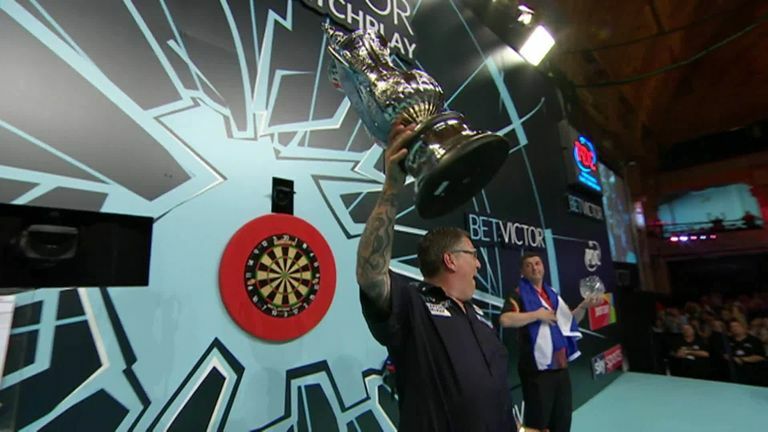 Gary Anderson says the Grand Slam of Darts is the one tournament he would love to win this year in his trophy-laden season on the PDC Tour. The Flying Scotsman won the UK Open in March before claiming titles at the US Darts Masters, the World Matchplay in Blackpool and the Champions League of Darts in Brighton to make it four televised titles for the year on Sunday. Currently ranked No 4 in the world, the 47-year-old has never won the Grand Slam in his career with his best result coming as a runner-up in 2011 before two consecutive semi-final appearances in 2016 and 2017. Ahead of the World Grand Prix this weekend, a tournament where The Flying Scotsman has enjoyed a mixed record, Anderson revealed it is another major that gets his juices following and he already knows how he plans to reward himself. "I'd love to win the Grand Slam," he told The Darts Show podcast. "That's the one tournament I'd love to have under my belt. If I win it, I'm going straight to the Harley [Davidson] shop and having a Fat Boy for a fat boy!" Anderson's recent dominance in the sport follows a spell which saw world No 1 Michael van Gerwen look unstoppable. When quizzed as to whether the Dutchman's run in the televised tournaments was as a result of other players improving or Van Gerwen simply starting to struggle, Anderson agreed with the former. "Your first answer, that's it. Same with Phil [Taylor]. Phil was dominant, started getting better and better, started to lose, and that's the same for Michael. "Peter [Wright] was behind him and he got stuck in [at the weekend], Michael started to bottle it. He's not losing it, the boys are just getting better." However, Anderson admitted to "riding his luck" over the last few months, and says that good fortune helped him in two narrow wins over MVG in the Champions League, both in the group stage and the semi-final. "I think I've rode my luck for the last 13, 14, 15 months. If you can still win, you can still win. "I kind of got stuck for four or five legs [against Van Gerwen]. It should have been done at 10-4, 10-5. In the end I was lucky. But he was lucky to get that far. He's a young kid, I'm an old boy." I think I've rode my luck for the last 13, 14, 15 months. If you can still win, you can still win. Anderson was asked if he felt he was feared by younger players in the game, similar to the way football teams feared the dominance of Manchester United in the 1990s, but the Scotsman rejected that notion. "The youngsters who come through the game, they don't care who you are," he added. "That's the thing they've got about them. They want to play Van Gerwen, Lewis, Anderson, Taylor - they want to play all the boys. "When they've been whipped a few times, they realise they don't want to play them!" The 43-year-old Welshman is a good friend of Anderson and was a runner-up at the Players Championship Finals last year. "I've tipped this boy for years. He's a lovely, lovely lad. He's getting on a bit himself but I think he's the best to come out of Wales. It's as simple as that. "He's a class act, and if he plays the game that he plays, he's one of the best." 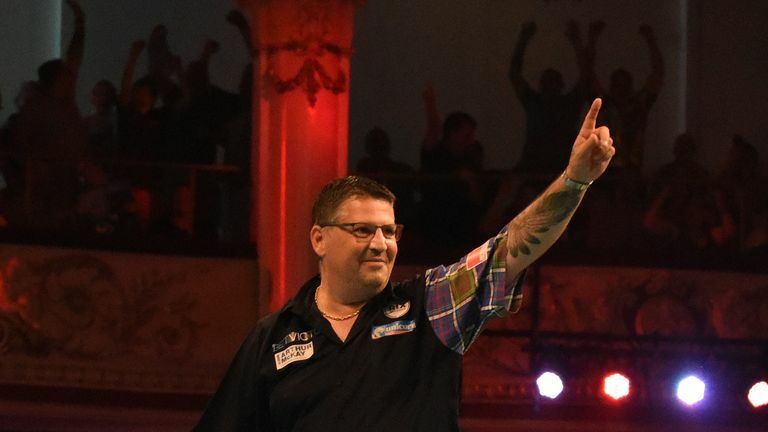 Gary Anderson was speaking to The Darts Show podcast - a new fortnightly show where you can catch up with all the latest news on and off the oche. Seven days of World Grand Prix coverage from the Citywest Hotel gets underway on Sky Sports Arena from 7pm on Sunday, September 30.